Girls Do Ski is searching for female skiers&rsquo; greatest retro ski stories. Stories can be from last season or from old school skiing days. If your submission is &ldquo;far out&rdquo; enough, Girls Do Ski will reward you with a glorious prize package from our affiliated sponsors. Victoria, B.C. (November 2, 2008) &ndash;Hey ladies, can you out-Retro the best?&nbsp; Send us your old school, or past season ski stories and we&rsquo;ll decide! &nbsp;If your story proves to be &ldquo;far-out&rdquo; enough we will reward you with a dazzling new prize package! The prize package includes: Rossignol jacket, Rossignol gloves, Rossignol t-shirt, Oakley Stockholm goggles, Red Mountain Resort lift ticket, 1 year subscription to The Ski Journal and 3 Pistil Design hats. 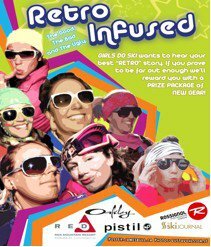 To enter, please visit http://www.girlsdoski.com, fill out the Entry Form, and elaborate on your &quot;retro&quot; story. Contest closes December 30th, 2008 at 11:59p.m. (Pacific Time).&nbsp; Contest is open to females living within North America.&nbsp; Please visit the website for full contest details.